Upon the return of Alfa Romeo to the USA after a 20 year absence, it was made clear that FIAT Chrysler Automobiles, the parent company of Alfa Romeo, wants to do things the right way. The first hint was that only a select few FIAT dealers are allowed to sell Alfa Romeos. Next was the successful advertising blitz during this year’s Super Bowl. Now FCA is going further by requesting that Alfa Romeo work with local chapters of the Alfa Romeo Owners Club. Who else knows as much about the Alfa Romeo marque…members of the Alfa Romeo Owners Club. Many of us here in the NYC/LI area have owned Alfa Romeos going back to the 60s, 70s and early 80s when there was no local chapter. We’re the ones who struggled through 20+ years of no official dealers, few independent mechanics, and hard to find parts. We’re the ones who know what it will take for Alfa Romeo to succeed again in the USA. 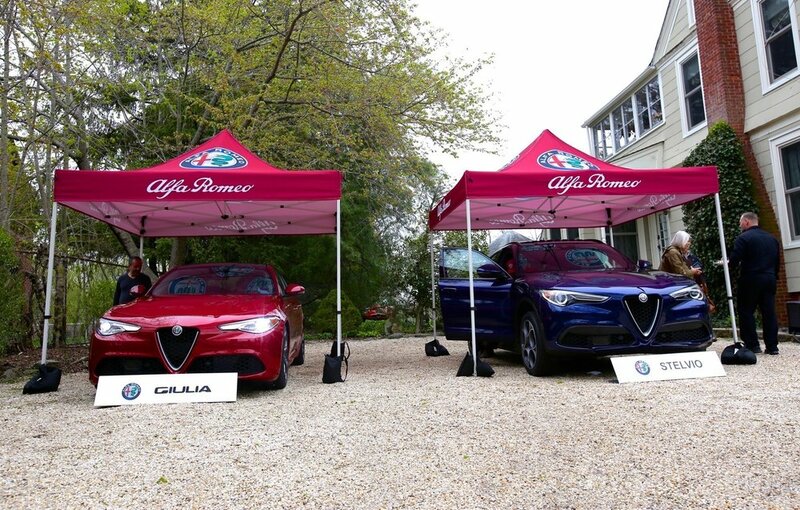 I was pleasantly surprised to receive a flier via email announcing that the New York Alfa Romeo Owners Club and Alfa Romeo USA were presenting An “Afternoon with the New Alfa Romeo Stelvio and Giulia” at the home of Alfa Romeo Owners Club National Legal Counsel George Pezold and his wife Lynn. I thought this was a great venue for Alfisti to have a hands-on look at the new models and at the same time provide direct input to Alfa Romeo USA. Pezold....we go back 30 years together. He has been an “uncle” image to me and many Alfisti here on Long Island. His decades of knowledge as an Alfa Romeo owner, and as an attorney has made him an valuable asset on a local and national basis. First to arrive after me was Vic and Gail Cerami in yes, you guessed it, a new Alfa Romeo Giulia TI Sport Sedan. The dark blue with tan leather interior is my favorite color combination. I had the pleasure of being the first “backseat” passenger when they took delivery just a few weeks ago. Other Alfisti started to trickle in. 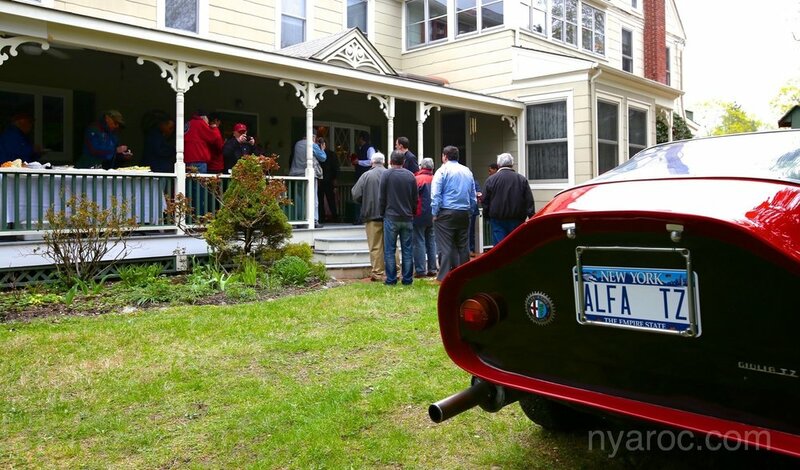 There were 30+ in attendance including two Alfa Romeo Owners Club national board members, our local chapter president Dr. Dino Pappous plus five previous chapter presidents. I spent time with one of our past presidents, Harry Nicolaides while he discussed Alfa Romeo’s future in the USA with Scott Cohen, FIAT Chrysler Automobiles (FCA) Senior Marketing Manager who traveled to Long Island from the Northeast Business Center. Harry’s first suggestion was that there needs to be a good lease program for the Giulia and Stelvio. Scott acknowledged that Alfa Romeo expects there to be 60%+ leasing on the new models here in the NYC metro area and that they are currently working with several banks to make viable leasing programs a reality in the near future. Harry’s next comment, another good one, was that prospective Alfa Romeo customers are not going to make a purchase (or lease) when they enter a dealership and are told that test drives are not possible. I can understand if it is a busy day and an Alfa Romeo sales person needs you to schedule a test drive. However, if a test drive in an Alfa Romeo Giulia or Stelvio (when they become available) is not made available at all then how can a dealer expect someone to purchase or lease a $40,000+ automobile. Sales people who just want you to “buy” an Alfa Romeo and not “sell” one to you should go back to what they were selling before whether it was Hondas, Chevys or sporting goods. My comments to Scott Cohen related to the customer after they take delivery of a new Alfa Romeo Giulia or Stelvio. There you are with your new Alfa Romeo parked in your driveway and your neighbors with high end Asian or European luxury automobiles might make ya feel that you didn’t exactly make a great decision in your automotive selection. My suggestion was that Alfa Romeo USA work directly with the Alfa Romeo Owners Club and for first time Alfa Romeo buyers provide them with a complimentary one year owners club membership. Within a few weeks of delivery the new owner would receive a welcoming letter from the national Alfa Romeo Owners Club president and then a letter with a schedule of local events from the local chapter president. 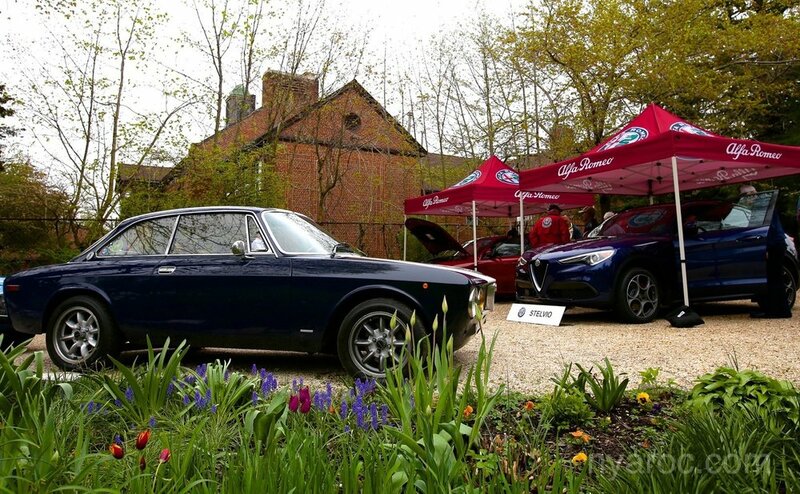 Once a new Alfa Romeo owner meets other local Alfisti, and attends a few local events they’re going to feel better about their automotive selection. They’ll treat their new Alfa Romeo with care.